We offer a wide variety of wood and resin drapery finials for use with our wood rodding. We can also use drapery finials from your preferred source or customer supplied, finished to match your order. 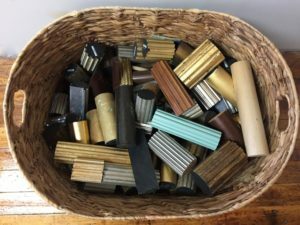 Finials for 1 3/8″ rods from our “Standard Metals” Line can also be used with our 1 3/8″ wood rodding. Hand turned custom drapery finials created per your specifications are also available. In addition to finials, we offer smooth rounded elbows and mitered elbows in both wood and metal. Below is a sampling of our drapery finials and elbows. Click on the size you want to filter the results. Click on any image to see a larger view of the finial and description.